A few coworkers and I went to a Pakistani/Indian restaurant near work for lunch! Orders are placed at the cashier, for either take-out or dine-in. There’s a small service charge to dine-in. Chai is self-serve from a drink dispenser! I ordered gola kabab meal (meals are combos which have rice, daal, naan, salad, and chutney/raita). 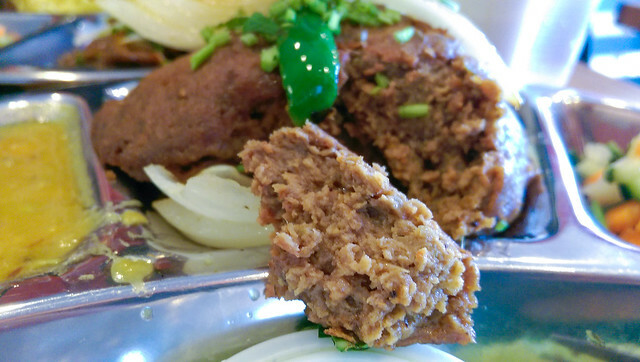 Zareen’s description of gola kabab was “sinfully delicious, melt in your mouth mince beef ‘gola’ kabab”. The gola kababs did indeed melt in my mouth! They were very soft and moist. The meal items accompanied the gola kababs really well. Gola kabab and seekh kabab both are the common dishes in Eid. Gola Kebabs are popular in India and Pakistan. The word ‘Gola’, loosely translated, means round…referring to the shape of the yummy kababs. 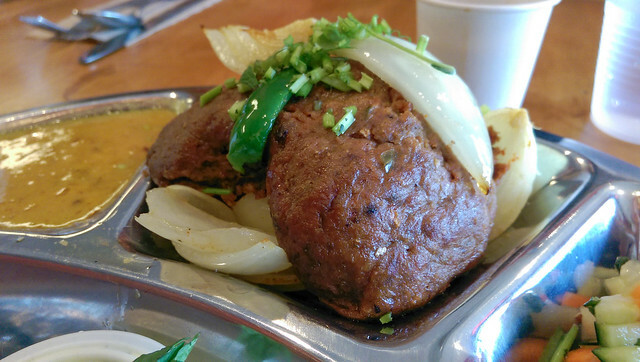 Gola/lola kabab is a kabab of Pakistan and Afghanistan – rolled meatballs originating in Peshawar and Kandahar. 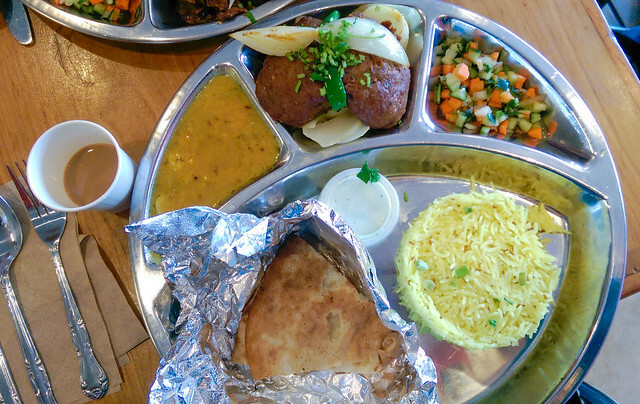 Naan Kebabs are not really dishes but are kind of essential adds to a Pakistani dining table. The kebab, is made from minced meat and naan with flour dough and there is a very wide variety of kebabs in Pakistan like, Tikka Kabab, Shami Kabab, Seekh Kabab, Gola Kabab and many more other types. Naan has many forms too, like Aloo Nan, Roghni Nan, Keema Nan and the list can grow pretty fast. Feel free to share in the comments section below, if you have any tidbits about gola kabab!